The scenario of our drop was that precious cargo must be delivered to an area that would not allow a plane or helicopter to land. Therefore, the cargo must be dropped. Due to vegetation, it would also be very difficult to depend on a parachute. Our cargo must survive ..... the drop without a parachute. We chose marshmallows as the cargo. The first task was to build the container for the cargo. The cargo could not be crushed or pierced in any way. Students tried all sorts of ways to harness that cargo. They built boxes and triangle shaped containers. The one below was unique in its design. Their idea was to suspend the cargo so it would never hit the ground. Pretty clever! What Made This a Challenge? I had a crazy rule about landing "square" on the ground. The carrier could not bounce or jar the cargo. It needed to just land without movement. The kids understood exactly what was needed when I compared this to a gymnast vaulting through the air and "sticking the landing"! In all of the above photos, you can see the original carrier and then the way it was improved. Kids discovered that those really small bases would not land without bouncing or turning over. When they added an extra large piece of cardboard to the bottom they would work! Absolutely! Our precious cargo was dropped from a 3-foot height and landed without being destroyed. Below you can see two of my favorite photos. 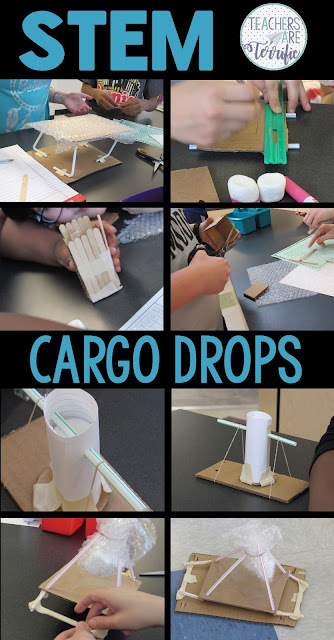 In the top photo, the team made a tube as their carrier and attached it to a small piece of cardboard. When they dropped it the carrier would bounce and flip over. Then they added a larger piece of cardboard, but they were out of tape. They ran a straw through the tube and used rubber bands to hold the bottom cardboard in place. It worked perfectly. Peek inside and you can see the marshmallows. In the above picture, the bottom portion is showing kids measuring and making sure the carrier will fit in place. I love seeing kids use their ideas and then work to improve and finish a device. This is a fabulous challenge with a very real-life application. These type of challenges always teach us something! Click on any of the images to see more about this challenge!